Power delivery crews are vital to Hoosier Energy’s mission of producing reliable energy for its members. 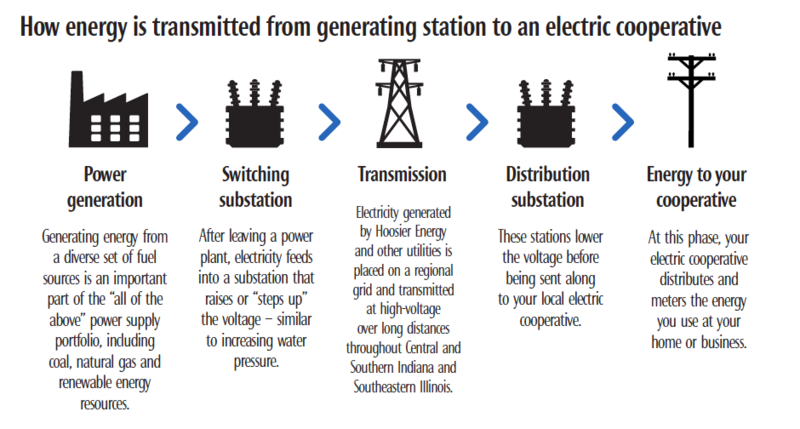 More than 110 employees are responsible for operating and maintaining Hoosier Energy’s section of the grid that transmits electricity across 48 counties in Central and Southern Indiana and 11 Southeastern Illinois counties. At the Merom Generating Station, for example, electricity is generated a at 23,000 volts. The generation step up transformer (GSU) increases thevoltage to as much as 765,000 volts. The energy voltages Hoosier Energy transmits range from 34,500 to 345,000. Similarly, most member cooperatives transmit energy at 12,470 volts or less. Electricity leaves the generation station at higher voltages, travels to power transformers called switching stations and then transmits to distribution substations where the voltage is stepped down, or reduced. From the substation, the electricity is distributed to the electric cooperatives and then on to consumer-members. Several terms are used when discussing the flow of electricity. Voltage is similar to water pressure. This is similar to the flow of water through a water pipe. In this case, this is the electricity flow through a power line. Current, or amps, is similar to the rate of water flow. The higher the voltage, the less the amperage. For example, 240 volts has half the amps of 120 volts. Ohms is resistance for the flow, similar to pipe size when dealing with water. Power delivery crews are strategically located throughout member service territory to maintain the grid. This helps reduce response times – getting crews in action quicker and problems identified at a faster pace. While power delivery is just one component in the larger Power Delivery Division, they play a very important role. Power delivery personnel work with varying volts, requiring specific training and skillsets. Safety is a top priority for all workers. 34.5 kv is the highest voltage where personal protection equipment such as protective rubber gloves are used. Specific training is required for this type of work. 69kv and above must be de-energized or worked on using ‘hot sticks.’ To work on these lines, mechanical grounds are put in place to protect workers. Workers have continual training and certification requirements in order to make sure they maintain a safe environment while working. Supervisory Control and Data Acquisition (SCADA) systems help improve reliability. Often these systems help determine the status of the grid remotely. SCADA allows an employee to read voltages and amperages (load) and even reroute the flow of electricity. Hoosier Energy has 30,000 SCADA points throughout the service area to help track issues in a timely and efficient manner. Do you know these power delivery terms? DE-ENERGIZED – An electrical circuit is de-energized when a fuse or switch is opened. If the transformer to your home is opened your house is de-energized. De-energized is not the same as dead in our lingo. GROUNDED – After a line is de-energized it is grounded. Workers treat a de-energized line as live unless it is grounded. Mechanical grounds are placed on a line to protect the workers. 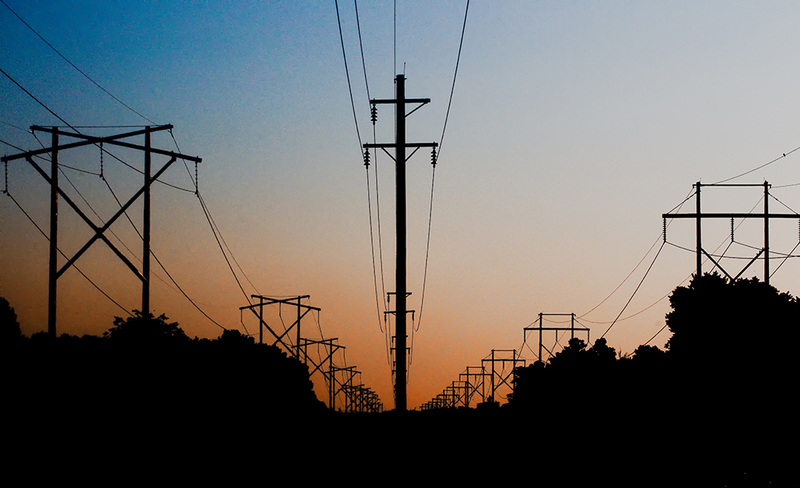 Accidental flow of electricity (a generator hooked up incorrectly) could cause electricity to flow on power lines. THREE PHASE – The electric lines, equipment and load are served from three separate phases. This is needed for bigger loads. REGULATOR – This is a device designed to keep a constant voltage on the power lines. This equipment will raise and lower the voltage as needed to keep customers at a relatively constant level.